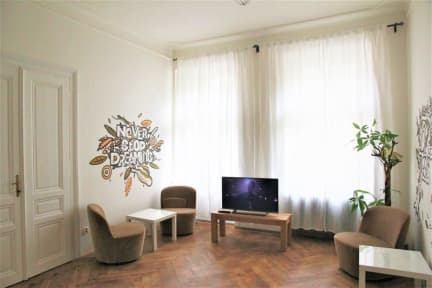 The Republic Garden is a small hostel located in a restored 19th century building, with high 4m ceilings, creative designed walls, wooden floors, common area for communication and games and comfortable rooms. We are non-smoking hostel, and our reception is open limited hours. The Republic Garden is located in an area with big range of different cafes, restaurants, clubs and shopping centers on different taste and flavour. The biggest shopping mall in the city center (Palladium) is located 2 minutes by walk from the hostel. Dlouha street with clubs and bars are located just 3 minutes by walk. Also near the hostel you will find restaurants and cafes with with your favourite cuisine, as well as galleries, museums and other interesting public places. We have dormitories with 4 up to 8 beds with personal lockers, and a small table with chairs, 3 comfortable rooms (4,5,8 beds), 3 bathrooms and kitchen. Hostel is located on the second floor, in the building there is no elevator. We offer free wifi, breakfast, towels, bed linen, tea & coffee facilities, hair dryer, Iron and iron desk, personal lockers near the bed, luggage room, and free maps and tours to you get around. Reception Time 11:00 to 21:00. (In case of late arrival please make sure to inform us via email or phone call).